If you follow me on Instagram you probably saw me peek this following card. I shared there that many of the commenters on my Simon Says Stamp You Have My Heart Blog Hop post stated they appreciated me sharing two different ways to use Simon's new Stepping Stone Background Stamp. Because of that, I decided to come up with three more ways to use this stamp and I'll be sharing them on my blog this month. For today's card I decided to cut out the insides of some of the circles to use as windows for some of Simon's new Stacking Animals to pop out of. Using Versafine Onyx Black Ink and Ranger's Medium Brayer, I stamped Simon's Stepping Stones Stamp onto Neenah 110 LB Smooth Solar White Cardstock. I then die cut the panel with the rectangle die from Simon's Bundle of Stitches Dies. I stamped, die cut, and coloured a bunch of Simon's Stacking Animals with Copic Markers. I figured out where I wanted to place these cute critters and used a Knife and Self-Healing Cutting Mat to cut out some of the circles. I adhered the animals to the stamped panel and used Foam Tape to adhere the panel to a notecard made from Simon's Audrey Blue Cardstock. The sentiment was white heat embossed and die cut from Simon's Black Cardstock using the smallest of Simon's Stitched Rectangles Dies. 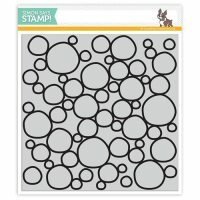 Now to announce the winner of the Simon Says Stamp You Have My Heart Blog Hop Prize. The winner from my blog is Kimber! Congrats Kimber! You should be hearing from Simon Says Stamp directly about your prize! Very cute card. I never use all the little stamps in sets, I may have to rethink that. Love this collection. ...that she's won the January 2016 Card Kit. If I don't here back from Karen before the end of Thursday I'll be picking a new winner. Your crd is so adorable. Love the third way you used the background stamp. Thanks for sharing. 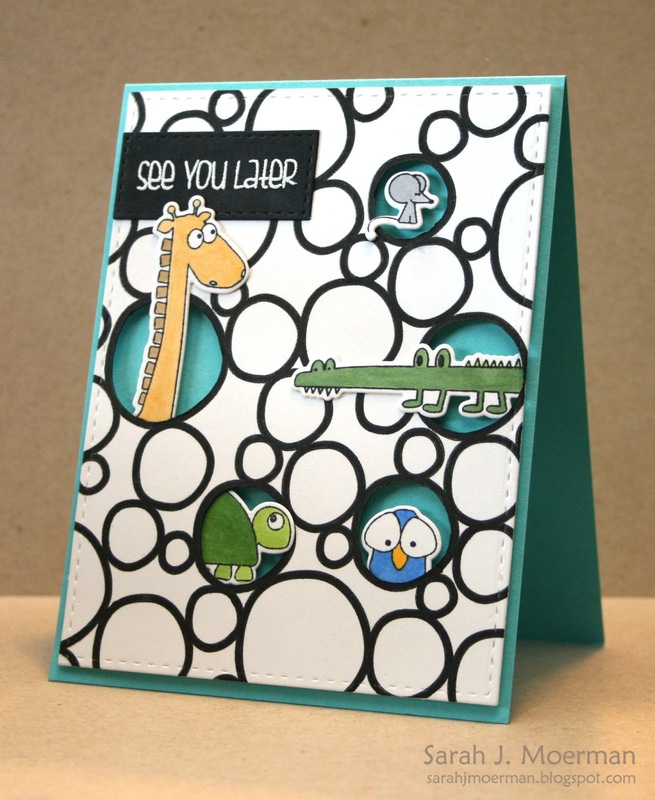 What a fabulous way to use that background stamp Sarah! Such a cute and fun card! What a cute way to use those stamps & dies! Love it!!! That is so cute. What a clever idea. This is so incredibly cute! Such a clever way to use the stamp! Super cute this card is!!! Very cute way to have them peeking out!